Ok, here is another update, sorry to be so sporadic – I have a bunch of new poems in this British small press anthology of American poets (basically a collection of four chapbooks) which you can find more information about here: https://thehighwindowpress.com/the-press/#Four%20American%20Poets – this includes the longest poem I’ve ever written, a ten pager in four sections. Check it out! Four New Poems in the Toast! I am not the best at updating this website BUT here are a few new things. My poem, “February,” was published by Open Letters Monthly. You can read it here. The first line of the poem is actually hand-written in sharpie on a coffeehouse wall in Los Angeles as well alongside years of other graffiti by other people. I might have written part of the poem there too but I don’t remember! For the sake of a better story, let’s say I did! A poem from my book, “Words from a Pound of Flesh,” was re-published by The Quotidian Bee here. This is a poem that was written some years ago but that still has a lot of meaning to me and which I am tempted to over-explain but which I will leave to speak for itself. There are a few copies of my book now at Malvern Books, in Austin, which is very nice. My book is print-on-demand, which means that instead of the publisher printing a “press run,” the book is printed when someone orders it. That means for the most part, it is available online through the usual suspects or at readings, to which I bring author copies. For whatever reason, I didn’t make getting it into actual live bookstores a big priority, I suppose because there were other things to think about when publishing a first book, but I did eventually get a few copies to Skylight Books in LA and now to Malvern and it is a very nice feeling to know that people can walk into a bookstore and see it and buy it if they wish! I will be doing a reading in Denver, at the Leon Art Gallery, on Mar. 5th at 5:00. Finally, My poem, “How Not To Need Resurrection,” is being included in the Pittsburgh Poetry Houses project, which you can find out more about here. The poetry house will be hosted by Randyland, a really cool looking public art site. Mine will be up for two weeks; I’m not exactly sure when yet, but I will let you know when I find out! I am very excited because I love public art and I wish I could visit, but the poem will also be available through the project’s website and hopefully I’ll get a picture of it in situ! A nice new review of my book, I’m glad she thinks it is often funny! My sense of humor can be a bit dry so I always worry that people miss it! 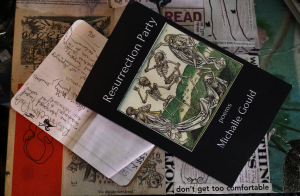 Today is the “official” release date of the short film adapted from my poem, “How Not To Need Resurrection,” first published in Poetry in 2003, then again in my book Resurrection Party (Silver Birch Press, 2014). In the supplementary interviews included with the film and the text of the poem at Motionpoems’ website here: http://www.motionpoems.com/resurrection/, one of the things I talk about is the challenge of the adaptation process, of the importance of letting go of your work and not developing preconceptions or expectations that will make it harder for you to open up to the filmmaker’s vision. Because poetry is less typically adapted than fiction, I think this can be more of a leap for us (poets), but a worthwhile one. I think one of the most interesting parts of this process was the way it caused me to reflect on the poem more as a reader might than as its writer. One of the things the filmmakers mentioned when first talking to me was that they had been especially intrigued by its last line, which is the one line that I had the hardest time with when first writing the poem and the only one I really changed from the first draft (the title also had a few iterations). That conversation and then seeing the film several months later helped me to feel like I really understood the meaning of that line and how it “completed” the rest of the poem in a new way. In the same way that reading good poems can make people interested in writing poems themselves, this whole experience has also revived some of my own interest in making short films, which is something I’ve dabbled in before. I’m hoping to eventually make my poem, “Tonight, the Clouds,” which can be read here: http://dailydoseoflit.com/2014/09/26/excerpt-michalle-gould/ into an animated film itself one day!